Richard Prager, MD (right) presented Curtis Tribble, MD with the 2014 STSA Inspiration Award during the Association’s 61st Annual Meeting in Tucson, AZ. To acknowledge the crucial importance of mentorship in developing CT surgeons and to recognize and positively reinforce STSA members who have excelled in their mentorship roles, STSA established its Inspiration Award in 2007. The Inspiration Award is given to the STSA member who has demonstrated exceptional efforts in motivating, inspiring, and cultivating the clinical and research talents of medical students, residents, and/or early career CT surgeons. STSA is currently accepting nominations for the 2015 Inspiration Award. Honor your STSA member mentor by nominating them for this great award. To nominate someone for the 2015 STSA Inspiration Award, please submit your nomination in writing by September 1. Recommendation letters should outline the specific merits of the nominee and his or her positive influences on the mentee(s). The recipient must be an STSA member in good standing. The award will be given at the discretion of the President in consultation with the Council. 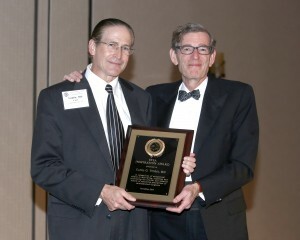 The Southern Thoracic Surgical Association has been important to me and my family for a long time. I suspect I come from one of the few families that have three current STSA members. The STSA Inspiration Award that I received at last fall’s meeting came as quite a surprise to me. I certainly appreciated learning about the support of my current and former students, residents, and associates who, I was told, nominated me for this award. I was also thrilled that the award was presented to me by one of my own favorite medical school mentors, Dr. Rich Prager, as he has certainly been a role model for me throughout my career. I believe that all of these relationships illustrate very well what the Southern Thoracic means to so many of us, which is that the organization is as much like family as any to which most of us belong. The 2015 Inspiration Award recipient will be announced at the November 7, 2015 Annual Awards Dinner & Dance. Register for the STSA 62nd Annual Meeting and secure your tickets to the Awards Dinner at www.stsa.org.62ndannual. View a list of all previous STSA Inspiration Award recipients at www.stsa.org/awards. Contact STSA Headquarters with questions at stsa@stsa.org or 800.685.7872.